Group 1: The group of Stephan Jud, Weronika Salach and Klaas Dhaene proposed a coherent strategy to implement a suburban campus within the area. 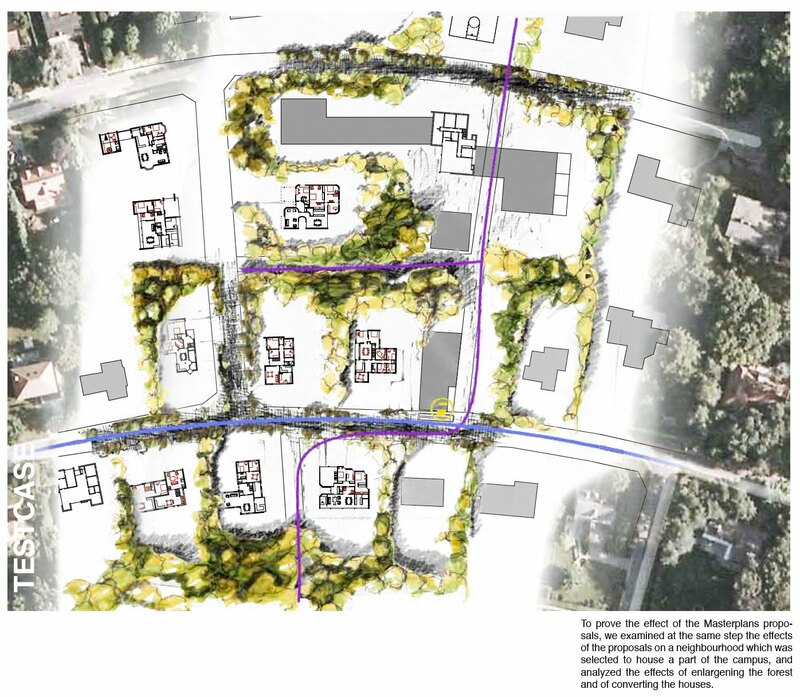 "With the proposed large-scale strategy and coherent small-scale interventions, the area of „Hoog Linden“ leaves behind its mono cultural „70s-Nuclear-Family“ atmosphere and attracts a wider range of inhabitants such as younger families and students. The core of the strategy is to embed a university campus over the entire area of Hoog Linden and at the same time maintaining the spatial qualities of this suburban settlement. In this project, the university provides some student accommodations, and sport facilities, all spread over the neighborhood. Parallel to this strategy, forest linkages are created through the quarter by changing the street layout, removing all hard boundaries and giving a forest quota for private parcels. Related to the mobility within the area, a new bus lin e is implemented with a high speed connection to the city of Leuven, but this line is also used as an internal line to interconnect the suburb. Gaining importance, the bus stops are now designed as interaction points providing functions such as a bar or a public meeting place. The original inhabitants, mostly retired people, now suffer from isolation and loneliness, and at times are in need of daily care. Embedding a university offers new voluntary jobs such as gardener, bartender or librarian for them but also provides the possibility of visiting or participating in lectures, using the restaurants and cafes, as well as some sport facilities. Living in over-dimensioned houses, the owners could now make small conversions of their houses to offer a broad range of student accommodations and several different forms of living together and maintaining the houses and gardens. By reducing car traffic and establish stronger walking and cycling routes, a secondary pathway system, connecting the different facilities is planned. Since there are many plots unused since the last 40 years, a temporary use such as sports field or a pathway, or even a vegetable garden can be established as an intermediate use. The prototype architectural project, as a next step, had to prove that a larger house typology such as an architectural university can fit into the existing neighborhood without damaging the intimate fabric of sub-urban sprawl. We chose a specific site where all the ingredients of the strategy could be retrieved and decided to house the department of architecture on this spot. The new campus buildings should be embedded in the landscape and interact in a self-evident way with the existing surrounding houses. Therefore, we terraced the large studio building and attached it to one of the existing houses. The neighboring studio and administration office adapts to the typology of the flat roof, setting itself into the background against the expressive auditorium building, which faces the inside square. The bus stop faces the main entrance to the public accessible café and library. A consequence of the new linkages between the forests is the partial redesign of the streets inside the forest strip. The intention was to change the surface of the street to mark the entrance to a different area. The choice for Belgian cobblestones is a wink to the recently built “Fermettes“ and, in combination with random planted trees a measure to slow down the car traffic. The new buildings partially appear on the street in a way to invite the inhabitants to participate and to use the facilities provided on the campus. The embedding of the buildings according to neighboring structures allows to create a different, more intimate although public atmosphere inside the plot grid, due to the lack of hard borders and the inviting shapes of the inner streets. "